Zola, our newest giraffe addition. This exciting annual event was initiated by the Giraffe Conservation Foundation (GCF) to celebrate the longest-necked animal on the longest day or night (depending on which hemisphere you live!) of the year – June 21 – every year! This special day is not only a worldwide celebration of these amazing and much-loved animals, but an annual event to raise support, create awareness and shed light on the challenges giraffes face in the wild. On “World Giraffe Day,” join us at the Milwaukee County Zoo, and listen to special zookeeper talks at the Giraffe Exhibit – at 11:15 a.m. and 2 p.m. 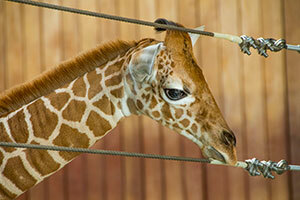 These short presentations will highlight our resident giraffe herd (which now numbers 6!) as well as conservation efforts to help these magnificent “gentle giants.” You’ll also meet our newest youngsters in the herd, male Tafari, and female Zola. Also on this day, Zoo Pride volunteers will be available to show giraffe artifacts and answer your giraffe questions! All proceeds from the giraffe feedings on June 21 will be donated directly to the Giraffe Conservation Foundation. Feedings take place at 10:30 a.m. and 3 p.m. and tickets can be purchased at the Giraffe Deck beginning at 9:30 a.m.
By supporting World Giraffe Day, you can directly help save giraffes in Africa. With only 90,000 giraffes remaining in the wild, the time is right to support these amazing animals!